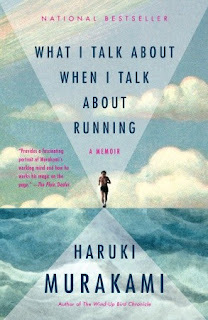 Run Junkie: RJ Review: Haruki Murakami's "What I Talk About When I Talk About Running"
RJ Review: Haruki Murakami's "What I Talk About When I Talk About Running"
"Nothing in the real world is as beautiful as the illusions of a person about to lose consciousness." "Most of what I know about writing I’ve learned through running every day." "To exaggerate a bit, it was as if by completing the over-sixty-mile race I’d stepped into a different place." Last week my wife couldn't contain her excitement about the English language release of Haruki Murakami's new 1,000 page novel, IQ84. It's swept Japan and, given the buzz in the lit world, is set to do the same in the US and England. Though I try to keep up on things literary, I admit the IQ84 phenomenon passed me by, but Murakami's name did ring a bell, and a quick Google search reminded me why. He wrote a non-fiction book on running released a couple years ago, called What I Talk About When I Talk About Running. Intrigued, I downloaded it to my Kindle and started clicking away. At just under 200 pages, it was a quick - and I have to say enjoyable - read. Murakami writes from the viewpoint of a dedicated mid-packer who simply loves to run and whose running suffuses his life, influencing his writing and driving his thoughts. It is a portrait I dare say most people reading these words can fully connect with. What was very strange to me as I made my way through this book was how often it seemed to echo my views of running and my running life. From his time in Boston and Cambridge spent running by the Charles River, to his drive to excel even when well behind the lead pack, to his views of the relationship between running and writing - this seemed like a book I could have written - if of course, I were a smart, dedicated, and accomplished novelist. Yet, this familiarity was in some ways a disappointment of the book. As much as I loved to see myself in the pages, the book didn't transport me to a higher place. Great essays - those by EB White or Adam Gopnik, just to name two - will take you from a place you know and lift you up to reveal something grander than you'd previously considered. And given Murakami's reputation, I admit to expecting that sort of experience. But it wasn't there. This may not really be fair, of course. He says in the afterward that the book should be viewed more as a running memoir than a true collection of essays, and it does have that feel to it: A tap-tap-tap of thoughts on paper that mimics the sound of a marathon stride. Still, it's an engaging rhythm, and I could hardly put the book down until I was finished with it. Murakami certainly isn't an everyman writer, but he is close to being an everyman runner, and it's great to have a book that is essentially a paean to the passionate mid-packer - to those who rarely win races but whose passion and love for the sport is no less rich and no less grand. I read this when it first came out, and I have to confess I was a bit disappointed. It is a good book, but I guess I was expecting more. I struggled to find the "Ah-ha! This is what this book is really about!" I'm not sure what I was expecting. The title, after all, is a perfect description of the content. Still, I think perhaps you nailed it with your assessment that it doesn't transport the reader to a higher place, doesn't really open the eyes and mind and heart in new ways. Seriously well-written review. I won't rush to go pick up a copy, but I could see reading it some day. @ Gretchen. Yes. Seemed like we had the same overall feelings about this. I certainly enjoyed it but was looking for more. @Bryon. Very much appreciate the feedback. I thought this one of the best books on running I've read (non-fiction or fiction). In it I found a like spirit that was able to verbalize what I couldn't. That connection in itself was a gift to me (someone basically just like me). I couldn't put the book down - never boring, beautifully moving from day to day with elegance. What more is needed than that? Sometimes just plain truth written well is powerful enough. Meta-Post: Run Junkie on Flotrack's "Run Junkie"
Photo of the Week - "Reflection at Sawtooth Lake"